BALLYBROWN NS RECEIVES A WELCOME GIFT! BALLYBROWN NS RECEIVES A WELCOME GIFT! 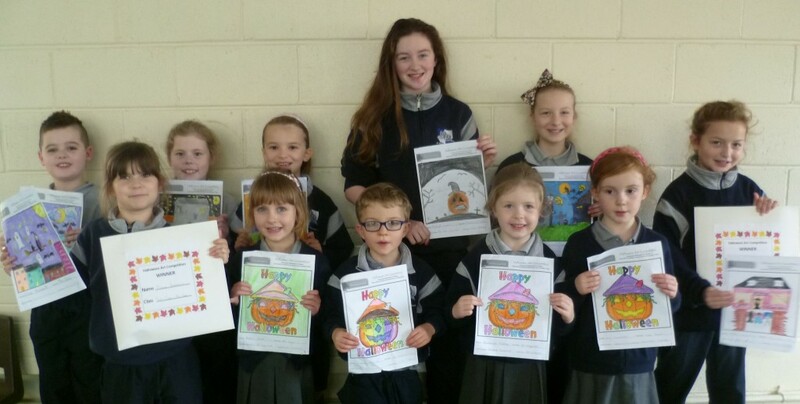 : Ballybrown NS received a very pleasant surprise as children and pupils prepared for the Summer break. 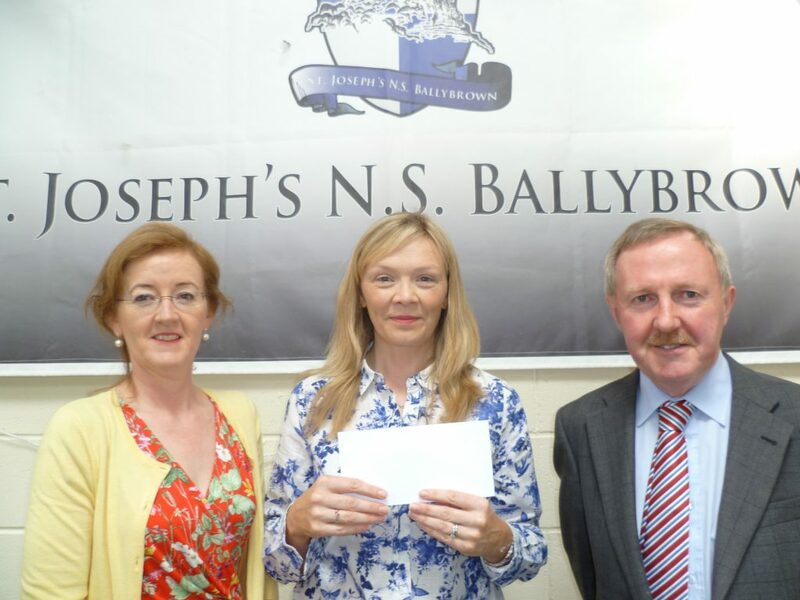 Lorraine Murphy, Chairperson of the School’s Parents Association, presented Principal Joe Lyons with a cheque for €2,100 towards the school’s investment in the Literacy Lift-Off programme. This was the second occasion in the current school year that the school received such a presentation from the Parents Association. 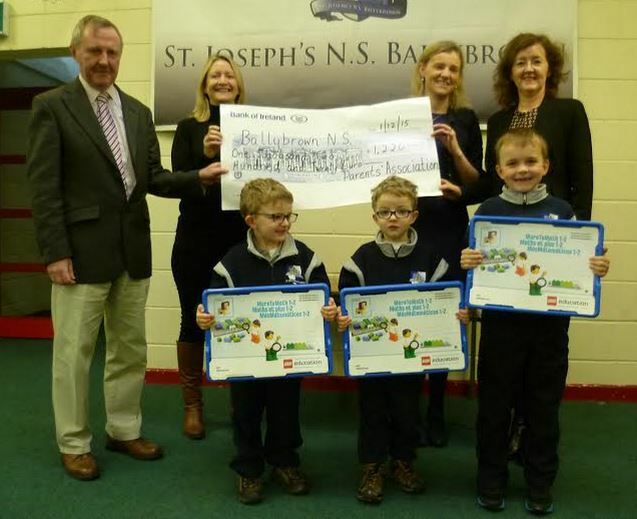 Last December, the Parents Association contributed €1200 to school funds which enabled the school to purchase an educational set of Lego and also to host a workshop in Maths by a company called Lifetime Labs. This was part of the school’s ongoing commitment to the STEM (Science, Technological, Engineering, Mechanical) subjects. The fundraising was achieved through a very successful Cake Sale, recycling of unwanted clothes and a Colours Day. BALLYBROWN NS YEARBOOK: The Ballybrown NS Yearbook, which chronicles the events of the past year, is on sale now in Hayes’s in Tervoe and Centra in Clarina. €3 each. FIRST HOLY COMMUNION : The First Holy Communion Ceremony for pupils attending Patrickswell and Ballybrown National Schools will take place on Saturday May 14 at 11.00am. This is not just a special family day but a celebration day for the parish and all are welcome. BALLYBROWN SCHOOL PARENTS ASSOCIATION CAKE SALE SUNDAY MAY 15 : The Parents Association will host a Cake Sale in the Resource Centre on Sunday May 15 after 10am mass to support the new Literacy for Life Program in Ballybrown School. This program is part of a national strategy to improve literacy standards among children. As part of the cake sale we are also running a “Bake Off” competition for 3rd to 6th class for all budding bakers. Finally there will be a raffle to close out what is sure to be an enjoyable morning. Light refreshments will be served. Your support would be greatly appreciated so get those baking bowls out! 10am mass in the Community Centre. from 3rd to 6th class as part of “bake off” competition. CONFIRMATION: Congratulations to the pupils of both Ballybrown and Patrickswell Schools who received the sacrament of Confirmation on Tuesday April 12. It is a special day…not just for our young people but for all of us to renew the gift of the Holy Spirit in our lives. BALLYBROWN SCHOOL NEWS: Limerick footballer Peter Nash visited Ballybrown NS to present medals to the members of the boys Under 13 team that won the Limerick City Cumann na mBunscol title in October. Peter spoke about the value of working hard, enjoying all sports, perseverance, giving of your best and the importance of Healthy Eating. He is an excellent role model for our young players. A special word of thanks to Mr Lordan and Mr Hodnett for the time and effort they put into coaching the team. The Parents Association also organised teams of parents to coordinate sales when the Annual Book Fair took place last Thursday and Friday, thus allowing children and parents to do some early Christmas shopping while also adding to the school’s store of books. 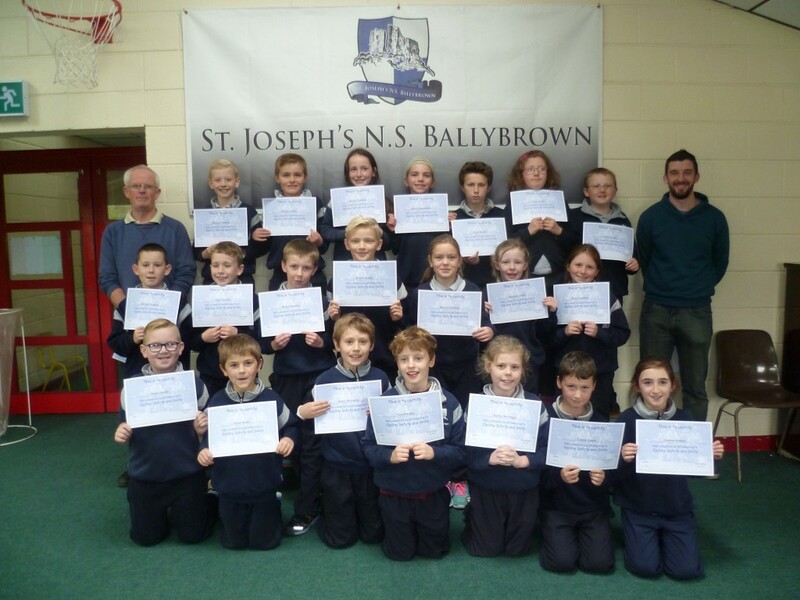 THIRD CLASS PUPILS ARE CYCLISTS SUPREME!